My homemade banana ice cream makes an appearance in this rich and decadent treat. The addition of peanut butter supplies an ample dose of protein and healthy fat to ward off hunger and fuel you with energy–not too shabby for a dessert! Toast the waffles until golden brown. Top one waffle with the peanut butter and the banana ice cream. 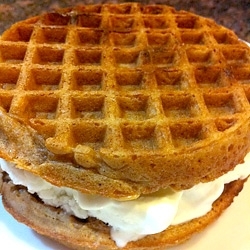 Top with second waffle and press gently to evenly spread the ice cream. Get the recipe for Banana Ice Cream.